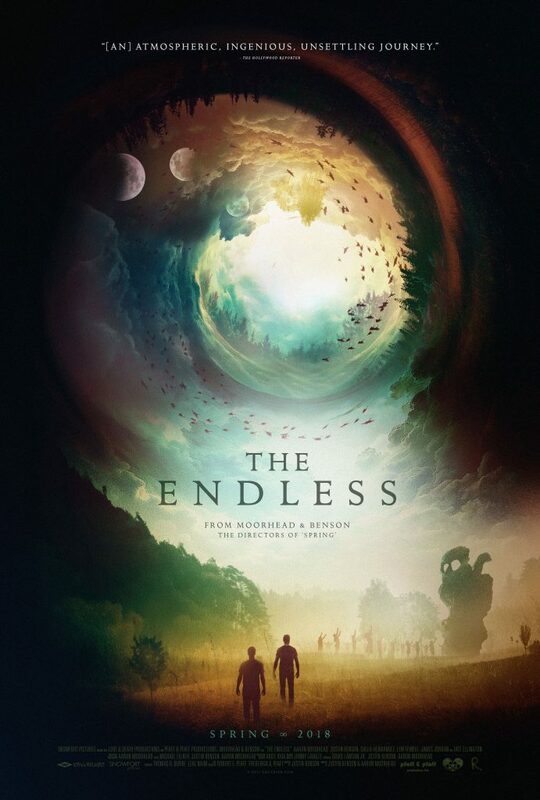 In THE ENDLESS, which begins its release tomorrow in New York City, hits Los Angeles April 13 and then expands nationwide, Benson (who also scripted) and Moorhead take the lead roles as well. They play Justin and Aaron, brothers who were part of “UFO death cult” as children before Justin helped them escape. After being convinced to return to the cult compound, known as Camp Arcadia, 10 years later, they find themselves welcomed back into the fold—and things get seriously strange from there (see our review here). Characters and events from RESOLUTION become folded into the story, as Benson and Moorhead (who made the acclaimed creature romance THE SPRING in between) venture into their most ambitious and fascinating territory yet. This interview (more of which appears in RUE MORGUE #180) took place following THE ENDLESS’ world premiere at last year’s Tribeca Film Festival. Were there any particular challenges to directing THE ENDLESS and starring in it at same time? AARON MOORHEAD: It was surprisingly easy, in a way, because we were so integrated into our own rehearsals. Sometimes there were little things involving the acting mechanics of eyelines, where we couldn’t see the monitor, that sort of thing, and we just figured that stuff out. We had a few practice runs, where we set up a little camera and made sure we knew what we were up to. We also had a wonderful team, whom we leaned on very heavily. There were only a few times that felt challenging—and when I say times, I mean 20 seconds. And it would be like, “Hang on, chill out. All right, got it.” We’ve worked together for so long that when we’re acting in a scene together, it kind of feels the same as when we’re discussing how we want the scene to be, you know? So your relationship as filmmakers informed your onscreen relationship as brothers? AM: In the sense of chemistry, but I don’t think in the sense of plot mechanics. In terms of him being domineering and me being someone who’s willing to take it, that isn’t quite so much our personalities. But in terms of the way we chat with each other, some of that comes across. There’s a water motif in SPRING, with its aquatic creature, and now in THE ENDLESS, in which “it” seems to dwell in a lake. Can you talk about that facet of the films? AM: We both grew up on the water—my dad’s a sailor, he was surfing his entire childhood—and there is so much myth when it comes to the water. It has a surface that’s beautiful, but underneath it, we all know it carries darkness and horrifying things that want to eat you, and you can’t stay down there for very long or you’ll die. It has that weird juxtaposition, and that’s why it’s a wonderful wellspring, no pun intended, of myth. We have such a love for it, and it brings us life and adventure and fun and beauty, but we’re all horrified of what’s underneath the surface. JUSTIN BENSON: The ancient Greeks had legends of sea monsters, and there aren’t even sharks off the coast of Greece. The human mind just comes up with creatures in that place, for some reason. AM: We had an interesting experience after SPRING, where a friend brought us in for a meeting to maybe do some work together, and he was telling us how our films were Lovecraft-inspired. And we were like, “Actually, no, we don’t even read Lovecraft, we don’t really know who that is.” I mean, we knew his name, but those movies just came from us. He got kind of serious, saying, “Oh, no, they definitely were,” and we were bristling a little, like, “No, they definitely weren’t!” Then he said, “OK, you haven’t read Lovecraft, but have you seen a horror movie?” “Yeah.” “Well, have you read Stephen King?” “Yeah.” And he said, “All of those people read Lovecraft. We all stand on Lovecraft’s shoulders.” It wasn’t antagonistic or anything like that, and now that some time has passed, and I’ve gotten familiar with Lovecraft…yeah, we do. We all stand on his shoulders, for sure. You have some impressive visual effects in THE ENDLESS; who created them for you? AM: Well, I’ve got a very happy answer: I did those. We had a small team; our assistant cameraperson, Erica Chan, wanted to learn how to do visual effects, so she was kind of doing a trial by fire. We had a motion graphics artist named Michael Matzur who did a lot of the designing, and then I did most of the final composites. In many ways, it goes back to the DIY approach to the film, even when we were developing the concept. We brainstormed some stuff like, “OK, we know the scale we want the movie to be, especially the ambitious feeling of the ending, but what can we do without it looking like garbage?” We made a list of things that worked thematically with what we were trying to do, especially when it came to “it”, and that would look interesting. Do you foresee yourselves further exploring the world of RESOLUTION and THE ENDLESS? JB: We keep talking about it. It’s very fertile creative ground for us. Usually in this business, when someone makes an entry in a franchise, whether you call it a sequel or not, it’s conceived as a business decision: “Oh, people liked that, let’s give them more of it.” And for us, it was literally, “This really inspired us.” There are lots of stories there, so hopefully we can tell more of them. The dream would be to do a TV show. Could this world ever intersect with that of SPRING? Could they be components of the same universe? JB: It kind of does. If you rewatch SPRING soon after seeing THE ENDLESS, there’s something at the beginning of SPRING that is a very conspicuous connection. AM: I just realized something: That thing you’re talking about in SPRING answers the biggest unanswered mysteries in THE ENDLESS. I don’t want to say what it is now, because it’s better for people to go digging, but yeah, it actually does. Your films are very ambiguous, at a time when a lot of horror movies are much more in your face. Can you talk about taking that approach to the genre? AM: It’s very natural for us. And actually, it’s not really an approach to the horror genre as such, it’s genuinely just the approach of the kind of movies we make. And so far, they’re very much horror, but they’re also very much something else. Just by following that small voice of “This kind of makes sense,” that’s how we end up with something that you could call a slower burn, maybe a less visceral thing. It’s never really a debate for us; it just kind of happens in our process of developing the movie. JB: Yeah, we’ve got a few different movies and TV shows in the developmental stages. We had a number of opportunities after SPRING to do something slightly bigger, but that takes a very long time; it’s a complicated process. I think we were able to make THE ENDLESS in the time it took for one little business step on one of our bigger movies that’s out there in the world. We always have about 10 projects going at once, and hopefully, one of them can go at any time. AM: It was a weirdly frightening thing to have opportunities that felt much, much bigger, especially after SPRING, and then decide to go and make a DIY movie. It makes sense now that it’s done and out in the world, but when we were about to start it, we were thinking, “Are we throwing away all of this work and momentum to go out and make this little film?” And now, it is only going to absolutely massively help all the other projects, and it’s like, thank God we did it, you know?